Whether you are organising a public or private event, Swan Hill Rural City Council has a suitable location that will meet your needs. If you are holding an event at a Council owned or managed facility it is the responsibility of the event organiser to ensure that all laws are complied with. You will be required to complete a Event Management application form and provide the relevant permits / requirements. Once Council has processed your application you will be notified in writing of the outcome within 10 working days. We advise you start planning three months prior to your event. This will ensure you have enough time to check availability of facilities and discuss your requirements. 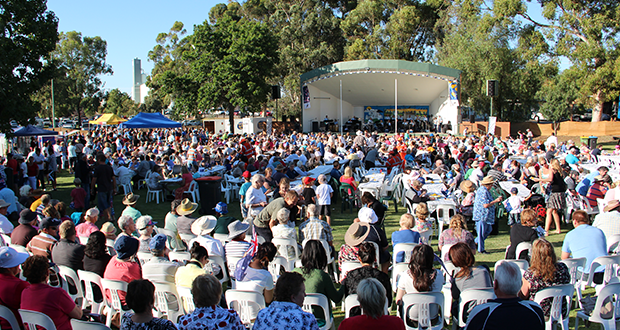 Through Council’s grants program, event organisers can seek funding for new or emerging events or existing events that provide significant economic and/or social benefit to the region. Learn more about Council’s Event Support Fund, and other grants. The events management guide will assist event organisers to understand event requirements and to ensure their events are compliant, safe and enjoyable for all participants. Thinking about hosting an event? Let us know! Council has a range of facilities that are available for hire to the public. Should you wish to hire one of these facilities you will need to contact Council at least 3 months prior to your event to check availability, discuss your requirements and make a tentative booking. Risk management is an integral part of responsible event management. Event organisers have a responsibility to demonstrate that risks associated with events are being managed effectively in order to ensure the health and safety of everyone who might be affected by the event. Undertaking a risk assessment prior to any event is a crucial step in the planning stage. It will ensure that risks are identified, are evaluated and controlled, which will result in better planning and a more successful event. Event organisers, whether Council, club, community group or individual, are responsible for ensuring that the necessary insurances are in place before the event can occur. The event organiser must provide a copy of insurances for the event and the hiring application to the owner/manager of the property where the event will be held. If the event is held on Council owned or managed property, Council must be provided with copies of all insurances covering the event. Information on obtaining event insurance can be found by contacting an insurance provider directly, or by visiting www.localcommunityinsurance.com.au. All events MUST have public liability insurance with cover of at least $10 million in place before they can proceed. This provides the event organiser - whether it be Council, a club, community group or individual - indemnity against compensation claims resulting from injury or property damage due to negligence of event organisers, staff or volunteers. Event public liability insurance does not cover other parties such as stallholders, performers, vendors, businesses or other people participating in the event. They must have their own public liability insurance and provide a copy of it to the event organiser. Council offers this cover for uninsured hirers who wish to hire Council owned or controlled property. i.e. for weddings, birthday parties etc. This insurance is only available to individuals or groups, for non-profit making activities that do not have existing public liability insurance. A hire agreement must be in place for the insurance to be valid. Conditions apply. Personal accident (also known as volunteers insurance) covers voluntary workers directly or indirectly connected with the event. A list of volunteers should be documented to support this insurance cover. Event organisers need to be aware of the health and safety issues associated with temporary food stalls, and that a permit is required before the sale and/or handling of food or drink can occur at an event. All temporary and mobile food vendors must register on the StreatTrader website at least five days prior to trading. This is a requirement under the Food Act. Event organisers need to check that food vendors have a Statement of Trade before allowing them to sell and/or handle food or drink at the event. If you are involved in any commercial activity on Council owned or managed land you will require a permit. This includes street stalls, trading or busking in addition to holding an event in a park and or reserve. If alcohol is to be supplied, consumed or sold at an event, you may require a valid liquor licence issued by Victorian Commission for Gambling and Liquor Regulation. Generally liquor licences are not required for private events where liquor will be supplied free of charge. A licence will always be required if liquor will be sold at an event. You should register your event with the Victoria Police who will advise you if a liquor licence is required for your event. Those selling alcohol must have completed the responsible serving of alcohol (RSA) training. You might also require a permit from Council' Regulatory Services Department. If your event requires local road closures you will need to lodge an application with Council at least six weeks prior to your event. You will need to submit with your event application a copy of your public liability insurance, evidence you have notified the local police and a Traffic Management Plan from an accredited traffic management firm. Closure of any main arterial road within the Swan Hill municipality (as listed below) will require approval from VicRoads at least 12 weeks prior to the event. You should contact them directly to discuss your requirements. Once road closure approvals have been granted, Council will contact all emergency services approx a week before the event. Council will also advertise the road closure in the local newspaper at a cost to the event organiser. If you plan to erect one of the following temporary structures you need a temporary occupancy permit (TOP) from Council. A registered building practitioner must erect any of these temporary structures . Prefabricated buildings exceeding 100m2 other than ones placed directly on the ground surface. The erection of the above temporary structures is subject to the approval of Council&apos;s Municipal Building Surveyor. If you are holding an event in a location not deemed to be normal practice, i.e. a music concert on a football oval, this area is classed as a Place of Public Entertainment (POPE). Under the Building Act 1993 and Regulations 2018 you must obtain a POPE occupancy permit from Council. Community based organisations using outdoor recreational facilities that are greater than 500 square metres (without temporary structures) and with a crowd less than 5,000 will be exempt from the requirement of a POPE occupancy permit. Fireworks and pyrotechnics must only to be carried out by a licensed pyrotechnician who is accredited by Work Safe Victoria. The pyrotechnician will be required to submit a notification of intention to discharge fireworks, a risk assessment and a site plan to Council for the event. If the day of the event is declared a total fire ban, additional permits must be sought from the Country Fire Authority (CFA) before proceeding. NOTE: Inflatable jumping castles or similar require adherence to Australian Standard 3533.4.1. Inflatable amusement devices can become a hazard if not properly set up and operated. They can become airborne during strong wind gusts, collapse trapping patrons and become overcrowded causing injury without adequate supervision. If any staff or volunteers associated with the event will be working with, supervising, or responsible for persons under the age of 18 years they must have a current Working with Children’s Check and carry the card with them at all times. Some exemptions do apply. A Working with Children Check is free for volunteers and can be completed online via the website below. A larger size event and/or the presence of alcohol will require security. It is important that the presence of licensed security personnel be considered for events on a case-by-case basis for crowd control and equipment and cash protection. Property damaged as a result of the event is the responsibility of the event organiser. Refer to the Facility/Grounds Inspection form in the application section. Management/Response Plan should be provided to all event organisers, key stakeholders, police and emergency service personnel. Advising or having emergency services personnel available at the event. A list of emergency personnel, and their contact details, who are authorised to evacuate people. Clear access and exit points available for emergency services personnel to reach patrons. Meeting point for emergency personnel (if required). Evacuation routes and designated evacuation assembly areas. These are to be included in the site map. The provision of first aid is critical at any event and will depend on the number of attendees expected. First aid posts must be equipped and easy for patrons to find. The table below is a guide suggested by St John’s Ambulance. A record of first aid injuries requiring treatment is to be kept by the first aid officers, and provided to the event organiser at the end of the event. This document may be required should a claim be made after the event. The event organiser should keep a record of all injuries or property damage that occurs at the event in case a claim is made. If an incident does occur, an Incident Report Form should be completed by the event organiser and anyone else affected to gather as much information as possible. Photos should also be taken if possible and attached to the incident report form. A copy of the form must also be submitted to Council. Refer to Appendix for Incident Report form example. Every event should aim to provide adequate toilet facilities. For small events, public toilets may be adequate but larger events may require the hire of additional toilet units. The number of toilets required will depend on the anticipated crowd numbers, patron gender and whether alcohol will be served at the event. Toilets should be located in a space which allows clear access for patrons. It is recommended that toilets be cleaned every two to three hours during the event, depending on volume. An extra charge may apply for additional cleaning to Council&#8217s public conveniences. Outdoor events require a ratio of approximately one toilet to every 200 people, plus one toilet with wheelchair access and baby change facilities. The provision and number of toilets may be part of your POPE permit conditions. Council’s public bins are not for the use of the event holder and participants. Event organisers are responsible for the waste and litter generated at the event and must arrange for additional bins to cater for the types of waste that will be generated at the event. It is recommended that waste stations consist of a general waste bins and a recycling bins. A standard formula for determining how many waste stations to provide is one bin per 50 patrons. Waste stations should be located near eating areas, exits and entrances. Additional waste bins and pick up services can be arranged with a local waste provider. Event organisers must ensure that the facility is left clean and tidy. Signs should be strategically placed so patrons are informed before entering the event. This minimises confusion, conflict and congestion at entry and exit points. Lighting for an event should be adequate to identify exits as well as corridors and aisles leading to them. The event organiser should become familiar with the location and operation of controls for lighting. If on-site electricity is required for an event, it is essential to check which services are available and where they are located. It is the event organisers responsibility to ensure all leads, equipment and appliances used are tested, tagged and comply with all legislative requirements including Electrical Safety (Installation) Regulations 2009 and relevant standards. All events with electrical installations must have suitable fire extinguishers or other devices present. Council’s Parks and Gardens Unit on (03) 5036 2324. Event organisers need to consider the health and comfort of patrons, especially during the summer months. It is recommended that drinking water be made freely available. If this is not feasible, water should be sold as the cheapest option. at least 20 metres away from any flammable objects or sources of ignition. The use of volunteers to support the staging of events is a great way to boost resources, spread the workload and increase participation. Staff and volunteers should be provided with pre event training, including clarifying roles, responsibilities and procedures especially in communication, emergency and security. Use of volunteers must be included and covered under your insurance policy. (Refer to Section 3a Volunteers Insurance) A volunteer sign in/sign out register must be in place and include the date, name of volunteer, start and end times, duties and space for the volunteers signature. This register is required to support the volunteer insurance policy. Under the Australian Copyright Act 1968, music is protected by copyright law and you require a licence to publicly perform either live and/or recorded music at a festival or event. Permission is provided in the form of licenses from the Australasian Performing Rights Association (APRA). The most common licence is a free event licence, for events that are free to the public. Consideration must be given to how noise from your event impacts on surrounding areas i.e. neighbors, other businesses etc. Negative impacts should be minimised by careful planning and communication to those who may be affected. It is suggested you notify these people in writing of the event and duration and times of music. The Environment Protection Authority (EPA) regulates noise for large outdoor music events. Complete the form below if you are planning to hold an event on Council owned or managed property in the Swan Hill municipality. You MUST refer to Council&apos;s Event Management publication (linked above) prior to completing this application form. This guide will advise you of event requirements which MUST be provided to Council along with this application form at least four weeks prior to the event. Once Council has processed your application you will be notified in writing of the outcome within 10 working days. Completing this Application does not constitute event approval.